If you’ve made your way to our blog, you are probably trying to choose a moving company. A Google inquiry for “dallas moving companies” or “moving to dallas” brings up dozens of movers. They’re all going to get your belongings from Point A to Point B, so does it matter which one I choose? Absolutely. Moving companies vary in quality, and you need to take a careful look at they way they operate to ensure the one you choose gets your possessions to your new home on time and in good condition. Here are a few question to ask yourself before you select a mover. 1. How Do They Treat My Things? Your possessions are precious to you. Keeping in mind that they will all be going into a truck for quite awhile, it’s important that your items are packed to maximize their protection. Most moving companies move your items outside, and then wrap and package them. This increases the chances of your items incurring dings and damage. Garrett’s Moving and Storage, on the other hand, shrink wraps and packages your furniture inside your home to prevent this damage. 2. What Kind of Insurance Policy Do They Have? There is always the possibility that an item may incur damage during a move no matter how well the item was packed. Getting moving insurance is a must. 3. What is Their Reputation? All industries have their share of bad apples and moving and storage is no exception. If your mover isn’t reputable, you could risk losing your material possessions, family heirlooms, and other items of personal and irreplaceable value. Be sure to check that your mover is licensed by checking the official database from the Texas Department of Motor Vehicles. In addition to being licensed, check and see if the mover has a good reputation and industry memberships. 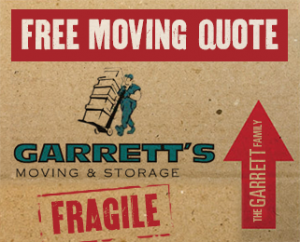 Garrett’s Moving and Storage has 20 years of experience in moving to Dallas and across the country, and we have an A+ Better Business Bureau Rating so you know your belongings will be in good hands. We are a proud member of the Southwest Movers Association. Contact us today at 972-487-5843 for a free estimate or click here to request a quote online. Keep a lookout for our next blog from the premier Dallas moving company. This entry was posted in Stress Free Moving Tips. Bookmark the permalink.